A customer is in your studio and you are discussing what kind of quilting you would like to be stitching onto her quilt. The more you are talking with her, the more confused she is looking. You KNOW that she is not understanding one word of what you are saying. Not only is quilting an art, quilting is a “language.” Depending if you are a piecer or a quilter your “language” is different. Piecer language is – half square triangles, bias edges, quarter square triangles, jelly rolls, layer cakes, batik fabric, foundation piecing, etc. These are words and phrases that refer to the process of taking large pieces of fabric and cutting them into small pieces of fabric, then sewing them back together to form a large piece of fabric! Quilting language is – feathers, stippling, fill in stitching, trapunto, template work, Sashiko, stitch in /near the ditch, etc. All of these words and phrases refer to the process of stitching the three layers (quilt top, batting and backing) together with thread to make these layers into a quilt. Usually, a quilter will understand a piecer, but most of the time, a piecer doesn’t understand a quilter. As a machine quilting business, you need to understand that most of the time your customer has NO clue to what you can do with your quilting machine. I make this statement this with absolutely NO dis-respect to any piecer. To me, this is like the relationship I have with my CPA. I give my CPA my business financial information, he does his “magic”, and presto, my books are done and I know what I have to pay in taxes! I have NO clue as to how he does this, and, I don’t want to know how he does this. As long as it gets done, that’s all I care about. Obviously, you will not be able to make a sample quilt for EVERY quilting design, pattern, technique that is “out there”, but you should be able to make a Sampler Quilt with MANY different stitching designs and patterns and have it hanging in your studio. If you prefer, you can make your own Sampler Quilt with the designs and techniques that YOU like and use on your quilts and your customer quilts. As long as you have something to show your customer when they don’t understand what you are saying, that is what matters the most. Samples that show the density of quilting – You can piece a quilt with maybe 4 blocks (2 across, 2 down) with sashing and borders and then quilt each quarter with a different density of quilting. From very “loose” – maybe big stipple, to super duper, over the top, custom quilting. Or you could make 3, 4 or more separate mini-quilts. I would suggest making them at least 18 – 24 inches square, and quilt them individually with super simple to super complex patterns / designs. Of course, each density should be priced differently, with the more complex patterns being the most expensive. If you quilt only pantographs, this will work for you also. 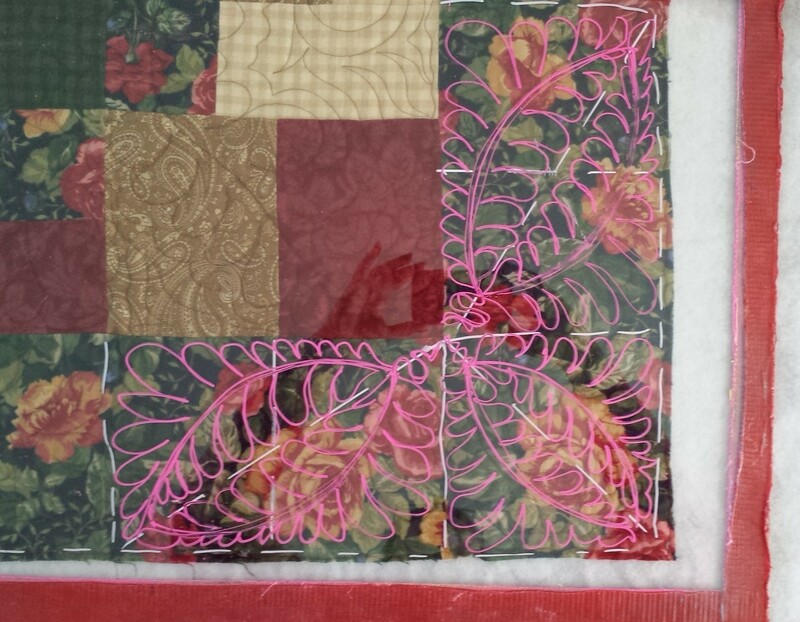 Make some mini-quilts and quilt them with a simple pantograph and with more complex patterns. The look of each mini-quilt will be different and, in my opinion, the more complex pattern should be a higher price. Samples that show different colors of thread – so many people are “locked” into having the same color of thread on the same color of fabric. In most cases, that is appropriate and works. But…. many times, by using a slightly different color of thread, maybe a shade or two lighter or darker, will make a HUGE difference in the look of the quilt. Maybe on one of your mini-quilts from above, you use different colors of thread! Samples that show something different – When I quilt, 98% of the time I use the same thread – brand, color, weight, etc.,- on the top and in the bobbin. Many customers assume that the color of the bobbin thread will match the color of the backing fabric. I have several samples that show that when using the different colors of thread on the back of the quilt, there is another quilt stitched onto the back! When the customer SEES this, they understand, and it makes my quilting life a whole lot easier! You may even make some mini quilts with the same fabrics, patterns, threads, but change the battings! And yes, different battings make a HUGE difference in the finished look of the quilt. Since the samples are specifically for your business, the fabric and supplies you purchase for samples is considered a business expense! Storage of samples can sometimes be an issue. I have big, big tote bins under my quilting machine where I store my samples. If I need a sample, all I need to know is what bin it is in and dig it out when I need to show it to a customer. I also think it looks really cool if you are finding the sample at the bottom of the bin and all the other quilts from the bin are stacked around you and your customer. It makes you look like your really know what you are doing and that you are incredibly talented – which you are! Start planning what samples you need to make for YOUR machine quilting business. If you have ideas for other samples, please let us know by writing in the comments section. If you have samples that you use in your business and want to send photos and an explanation, please send them to longarmu@aol.com and I will post the photos on this blog. As always, I look forward to your ideas and comments.